I spend time – too much it – trying to keep my desk in check. Like a taciturn child, it erupts with tantrums of disorganization. The fact that it’s a mess today seems unfair, as if a hole suddenly formed in the ceiling above me and dropped a cache of briefs, case opinions and half-used legal pads onto my workspace. I shuffle the papers that lay before me. They look back at me. Ten minutes go by. I reshuffle everything all over again. Sound familiar? 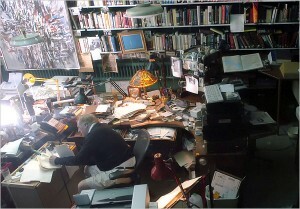 Mind you, on the Clutter-o-Scale, my desk is only a 4 out of 10. If so, why the grief? Too many things compete for lawyers’ attention besides the usual culprits of returning phone calls, court appearances and last minute deadlines. When you add a messy desk to an already stressed-out life, well, it becomes the enemy. Desks are the pedestals of our productivity. How we organize the stuff on them has a big effect on how well or if we get things done in a timely fashion. But just as important as these practical concerns is the impact it has on our mental health. 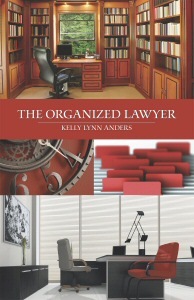 What is your Organizational Style? Stackers organize by topic in stacks. They are visual and tactile and like to give the appearance of order. The busier these people are, the more stacks they have. Spreaders are visual like stackers, but must be able to see everything they’re working on. Free Spirits keep very few personal belongings around the work area. They like new ideas and keep reports, books, articles and magazines near. Pack Rats have emotional ties to things. They like the feeling of fullness around them and like to tell stories about what’s in the office. Which type are you? She has a lot of useful suggestions, among them is color coding files. On her own desk, she keeps commonly used files close at hand. Because she identifies herself as a “stacker,” Anders avoids cabinets and other hidden spaces for her files. “The reason I don’t have a lot of hidden storage is stackers have a tendency to squirrel things away,” she said. Check out some of her other suggestions at her website. Einstein considered his cluttered desk a help rather than a hindrance to his prodigious creativity. While we don’t have his brain’s elephantine computing power, it’s worth considering that your desk mess might not be so bad after all. Dr. Jay Brand, a psychology professor, argues that a squeaky clean desk doesn’t always equate with a productive employee. It can actually hinder personal efficiency because a person’s desk is an extension of his/her mind. That’s because our human memory has a limited capacity, or finite ‘cells’ available for storage and since most people do multiple things at once they almost immediately ramp their working memory to capacity. They need a place to park some of the information from their working memory into the environment and what more logical place than their desks? According to Dr. Brand, “these cluttered desks that people use to store information from their working memory are called ‘cognitive artifacts’, and they expand a person’s capacity to think and utilize the environment”. He argues that companies with clean desk policies waste time by requiring workers to clean up their cognitive artifacts every night and re-clutter them the next morning. He points out that everyone has a different working style and piles can be organized topically, chronologically, or according to an individual system. As long as the pile means something to the person who made it, it is effective. I’ve known plenty lawyers in this group. But I ain’t one of them. Maybe it has to do with my own depression over the years. Or, as Kelly Anders suggests, it’s just my type that determines how I lay out the work space in front of me. When a lawyer has depression, motivation and organization are BIG problems. A lack of energy blunts motivation. We already know that it’s a good idea to keep our desk together, but there simply isn’t much neurochemical juice to get it done. But, time or a court’s scheduling order waits for no one. If we don’t keep the paperwork on the conveyor moving, we end up a casualty of our work days and add to the stress/anxiety/depression mix. So it appears that folks who aren’t depressed and are motivated people have ramped up brain metabolism. I’m envious. Yet, there is something we can do about it. As I’ve written about before, consistent exercise helps boost the happy chemicals in our brains, jacks up metabolism and improves our motivation and focus. Moving is motivating. We must outfox depression. It would have us do nothing. So we must do something. When I apply this simple wisdom to my day, I’m always pleasantly surprised at how my feelings catch up with my doing and how my doing affects my feelings. 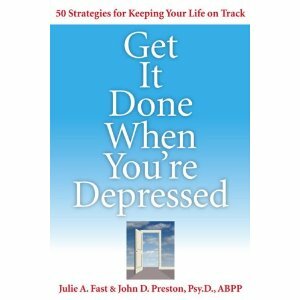 My experience during bogged down moods, was that I’d get most things done, but it would take lots of energy. When I’d come home from work, I’d be spent. I agree with an observation made by Leo Babauta on his blog Zen Habits: “The most important thing to remember is that you must have a system in place, and you must teach yourself to follow the system. Otherwise, you just clean your desk, and it gets messy again”. 1. Get rid of all those pens. Only keep three or four. More than that, and there’s too much ink in your work space. If you love pen, keep your stash at home. I often troll the pen aisle at Office Max — strange, but true. So I know how difficult it is to part with them. 2. Take home any books that you don’t use on a regular basis. It’s just more clutter and keeps you from easily putting your hands on the important stuff you need to do your job. 3. Hide cords – these are like a floating octopi with tenticles that seemingly go everywhere. Use twist-ties or coil your cords up. 4. Only keep on your desk what you need for that day. Then section off your desk and workspace so that everything has a specific space. 5. Have a dump day. Take everything off your desk and out of your drawer and then put it in a big pile. Then, sort through what is garbage and what you really need throughout the workday. 6. Schedule a date and time to clean your desk. Ideally, at the end of a workday. Weather permitting, do it on Friday’s around 4 so that I start my Monday fresh. Thanks for the tips and the reference to the book. I’m not a lawyer but I work with many cases that are time-sensitive and I think the book might help me. You’re very welcome, Alison. Keep visiting the site.